Erase your cache and reset your bookmarks! Yikes! It's about time. clear your bookmark for this page and the CC page should come up. You may have to erase the cache as well. 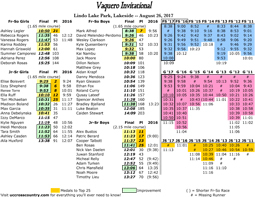 The blue links are there, including the updated meet schedule (on the left) and a link to Mike Boisvert's always awesome pics, the Vaquero Invitational. 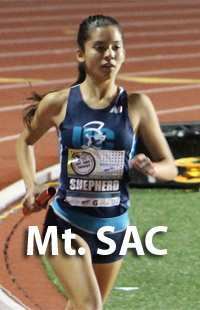 There's more coming up, so journey over to the blue side, and we'll dive deep into the cross country season together. 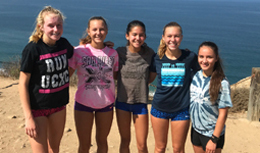 Out of 54 total runners that competed yesterday for UC in the inaugural Western League Cluster Meet on the Morley Field Course, 47 athletes ran lifetime PR's and Elise Boisvert missed the course record by only four seconds in her impressive win. Storming in close behind, Ella Ruff, Renee Torre, Isabelle Shepherd and Kendall Quesenberry rounded out the scoring that would knock the Coronado girls team off the league favorite podium and their #2 county ranking. 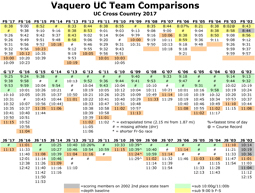 The UC athletes demonstrated tremendous teamwork in all six races, pushing each other to impressive lifetime bests. Click the link below for a cool look at the scoring breakdown. 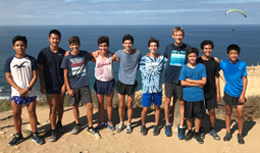 We are meeting with the kids today at 9:00 to run over the Western League course so that all of us can be comfortable with it again and ready for competition beginning October 3. After we do some running on the course, we'll need to do a little work on some areas that took a little wear and tear during the heavy rains this winter. Please bring a rake and gloves, if you have these items. Shovels might help too. Parents: We are meeting at 10:30 to jog the course so that you can learn the course that the kids will be running during our league competitions. Plan to join us with some running shoes on, and experience what the kids have become so expertly skilled at! Hope to see you here today. For directions to Morley Field, click the blue "CROSS COUNTRY" tab above, and then the blue "morley field" tab on the left side of the page. In the meantime, here is the course below. We are ready for an exciting evening of races at Woodbridge on Saturday . 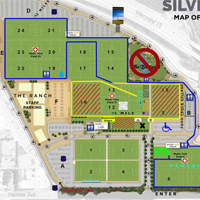 Most of us will meet at UC at 12:30 p.m. in front of the gym for our drive up to the Silverlakes Sports Park in Norco (directions below). There are three groups listed below with meeting times in black above the group. We need to make sure everyone has a ride and minimize the logistical nightmare of everyone driving at a different time. The race schedule with our tentative entries is listed below. We are ready to run fast and this is the place to do it. 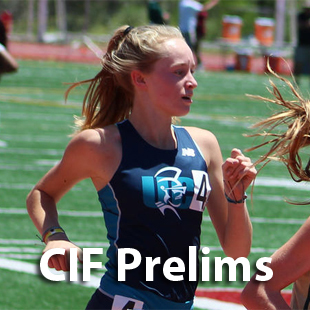 This is one of the most exciting invitational meets in the country and a great learning ground for all levels of competitors. Remember: Don't perseverate on the outcome; it's all about the process. Translation: Your coaches will give you a specific plan. Focus on just that plan: what you have to do during the race. Enjoy the process. See you all Saturday. How many of you will come up to me before your race and say, "Coach, I'm ready!"? tools for us to better get an idea of where we need to close ranks in order to be a more effective team. 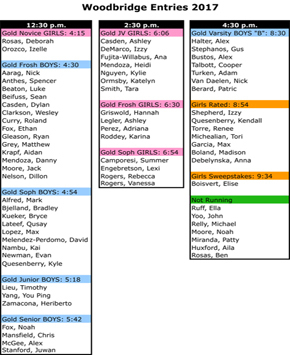 The results show a nice combined result for the girls (boys were unable to merge because of the different distances). Look where you finished and see who you raced with or close to from our team. 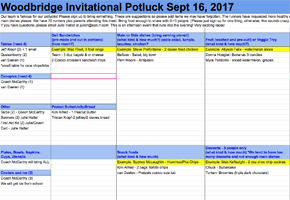 These races should give us a better idea of who we should be training with, or who we WANT to train with to jump up a notch or two. Congratulations on a great first day of racing. I will be switching over to the Cross Country tab (blue pages) in the next day or so, so stay tuned for that. See you all on Monday after school. Here is the meet information for this Saturday. Please meet us in front of the gym at 6:10 a.m. Saturday morning (I know I originally said 6:15, but those 5 minutes will make a difference).. We will carpool to the meet, which is relatively close by. We do need parent drivers to transport the kids, so plan on participating in this wonderful event. 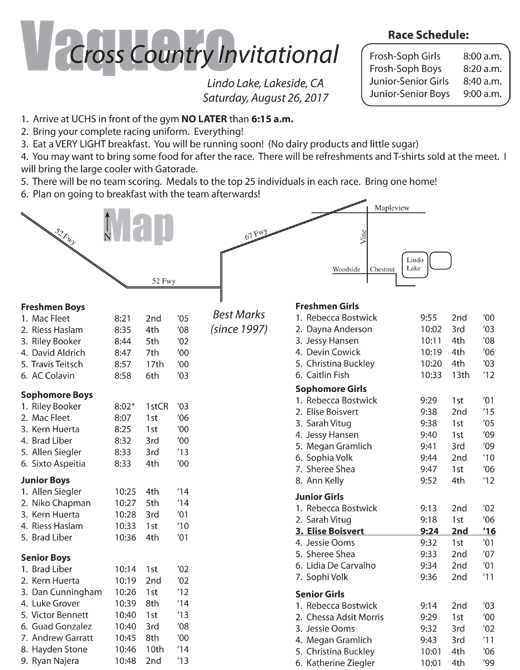 Athletes: check out the sheet below as a guide to where you might fit in to the front end of these races. We have to set our goals high, don't we? Remember that this year, our goal is to focus on "PROCESS" and not "OUTCOME", which means you are thinking more about HOW you are going to get there, instead of WHERE you would like to, or need to finish. That means I want to see some BIG risks taken BEFORE half way in the race. No thinking allowed after that point. Let survival instinct get you to the finish line! This was the year of the freshmen with Mac Fleet, Masami Okada, Adam Scherling and Guadalupe Gonzalez among many others taking starring roles for the varsity squad. Injury would cut Mac's season a little short, but the boys would lay a foundation that eventually grew to superstardom and a #1 county ranking by the time they were seniors. Freshman Guad is only the sixth best frosh on the emerging team. 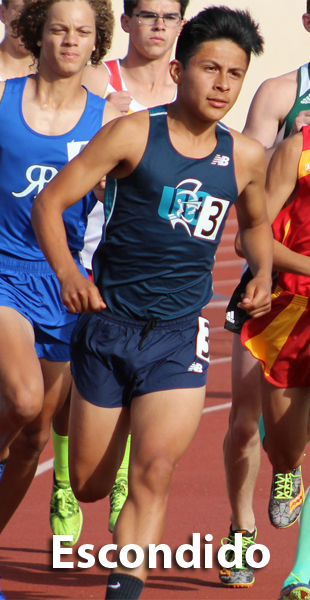 Senior Guad is 3rd best in San Diego County and tenth at state. Freshman Macky wins the varsity meet at Morley Field against Scripps in 16:37. Senior Mac is county champion, state champion, and eventual national champion in track. Back to the Glider Port! The Aerobic Power runs are underway! Beautiful weather and a partial eclipse made this morning's run the beginning of a fantastic day. Next Saturday, September 2, Coach Joe Vigil will be coming to San Diego to talk to coaches and athletes about his successes as a coach and professor of physiology, and to talk about all levels of training. I am hoping to bring a large group of our team to hear him talk about his ideas of training. He has coached several Olympians and world class runners, but most famously, he created the Adams State program in Colorado, one of the most successful and storied college running programs in the nation. Look at the photo below. 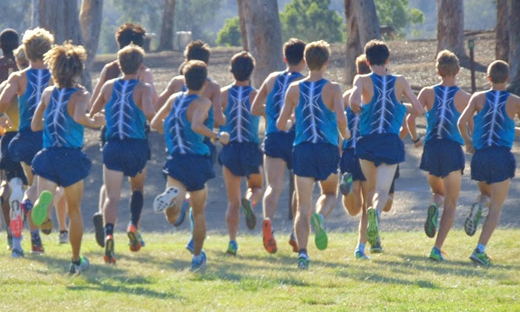 This is a picture of the lead pack of the NCAA Division 2 Cross Country National Championships with less than a mile to go (10K race distance). 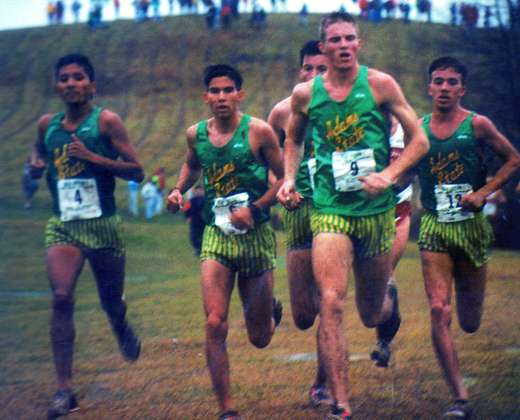 This famous men's team was arguably Coach Vigil's greatest creation, finishing 1-2-3-4-5 at the National Championships. This was the first and only time this has ever been done, scoring a perfect 15 points at the peak of the season on one of the country's biggest stages. They all finished the 10 kilometer race within a span of 4 seconds. Yes, this is a coach's dream. Can we be this good? Can We Be This Good? 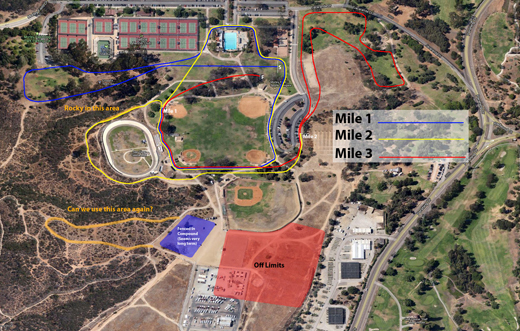 Check out this video of the first half mile from the Western League Cross Country Championships in 2013. The boys are rolling out of the Dog Loop, the majority of the team right up front and definitely able to touch each other. They're that close. These boys trained hard together for four straight years, the only way to be this good. Can we do this? I don't think it's too late. Team leaders: Let's Roll! Stay tuned. More videos to come. 2013 Western League: Dog Loop from Gimi McCarthy on Vimeo. Apologies to Mike for not getting these up during the heat of the season. Check out these great season-long pics that Mike has faithfully given to the team. There are thousands of great memories captured throughout the season that tell a passionate story of agony, persistence, strength, pain, commitment and ultimately, triumph. Thanks, Mike for all the consistent dedication of your time and energy to this great track team. Summer Training Is Well Underway! Beginning on June 26, we begin our traditional summer schedule with Week #1. For these first two weeks during the Coaches "No Contact" period, the kids will be meeting each day according to our training schedule linked HERE (and under "mileage goals" at left). June 19-23, the team will meet all 5 days (M-F) at Standley Park. Beginning on June 26, Monday Wednesday and Friday, the kids will meet at Standley Park at 8:30. Tuesday will be at PQ Canyon WEST end, and Thursday will be at Mission Bay. All weekday runs are at 8:30. Remember that Saturday runs, at different locations each week, has a start time of 8:00 a.m. because we are meeting other teams there. Plan your summer well and follow the training information on the back of your running log. We have a phenomenal group that has already begun training, and our team looks great! We are going to be a great team again, but only if YOU do the work this summer. Read the mileage goals sheet to plan out your summer framework. How many miles will you run from today until September 17th? Do You Plan to Travel and Be Varsity? Then you should plan on being at all of the Saturday runs and all of the hard workout days, unless you have another pre-arranged engagement. Make this part of your training important to you. "Pre-arranged" also means that you let me know well in advance. Which group are you in? Many times the groups will be mixed together on longer runs. Being in a slower group does not necessarily mean you will be running slower than the faster groups each day. It means you MAY be running shorter and/or you MAY be running slower. Always strive to be better. This is important! Everyone will be running the same course. We are not splitting up all over the city. We'll have different runs each day, but all groups will follow each other. Most runs are out-and-back, which means you will follow the same course, but likely turn around earlier. 1. You must fill out the running log EVERY DAY. This is mandatory to be part of the mileage club AND to go to camp. I will not accept just numbers in the daily mileage box. You need to write a daily journal: where you ran, with whom, how you felt, how long the run took to complete, any extra exercises/activities for that day. This is the only way you can compare your improvement to previous workouts over the same course. This is very easy to do thanks to Gus and his father who created and printed the running logs for us. 2. If you're in town, you need to be running with the team. This is the only way to run FAR enough and FAST enough, the two "F" words that make us great. 3. Camp is an awesome experience, but to qualify to attend, you must be on track to achieve the appropriate mileage goals assigned to you. Make sure you have talked to me about your goals before the first week of training is over. 4. If you can't make it to practice for vacation or other previously scheduled activities, understand that you MUST STILL RUN. You cannot progress in mileage if you don't complete the appropriate mileage the week before. One week builds on the next, so you have to get it done. Wherever you are going, there is still Earth, and the laws of gravity remain the same, so put on your shoes and get out the door. NEVER make decisions from the couch. All meeting times are at 8:30 a.m. Check the location links on the left for directions. Saturday runs are at 8:00 a.m. at varying locations. Saturday Run locations are linked on the left. 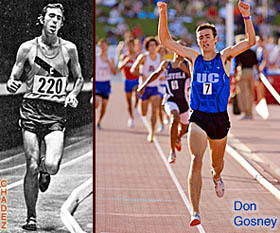 For all you history nuts, click on the pics above for a great history of just about everything running and racing, including some epic pictures. This is a great archive that is updated periodically, so I will have a permanent link to it. Dale and Mac are on page 40. 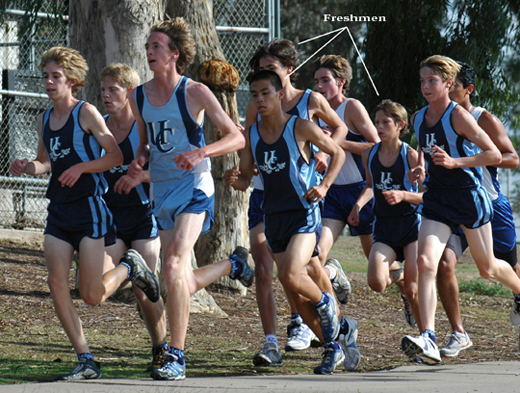 There are also some other great pictures of Dale in his running days, as well as current high school and collegians that you will all recognize. Check it out. © 2011 University City High School Cross Country, All Rights Reserved.